Joe Stones Computer Controlled RIMS Page: Joe uses a 286 PC with an ADIO board. He wrote the program himself. I used the same approach, but use an I2C controller with dedicated I2C chips instead of one ADIO board. Lots of useful information. C.D. Pritchard's RIMS Page: A lot of construction details can be found. C.D. uses a Basic Stamp to automate things, which works excellent. Advantage is that it is very small. Disadvantage is the small amount of IO. But newer Basic Stamps come with integrated I2C commands, so it is easy to add additional hardware. He has some interesting remarks on fluid level transducers. 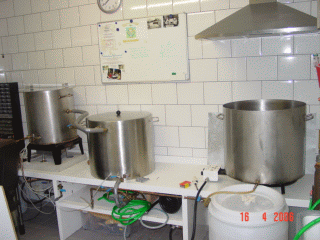 Dion Hollenbeck's RIMS Info Page: Excellent site on automation of a brewing setup. Learned many things from Dion. He has a very interesting description of the use of a MPX2010 pressure sensor to read the fluid level in the pan. Hobbybrouwen. This site contains a lot of information for the home-brewer (in Dutch), including many useful links. In the forum of this site you can establish contacts with other home-brewers, ask questions and exchange information. Most home-brewers upload their recipes and their experiences, making this THE site to learn about brewing. Beer Inspectors Guild: Lots of information (Dutch) about inspecting beer, you can even follow courses about it! Brewzilla, everything on (home) beer brewing: Excellent site with lots of information. Check out the Home Brewery Index. The web-site of my brew buddy George. He is also a professional construction builder. Ronald Rakké's electronics site: My (ex)colleague, drinking buddy and brother in arms. Creates great Visual Basic applications for the I2C bus. Check out his humidity sensor hardware and software! Logt Audio. The web-site of my youngest brother Leon. Great electronics engineer, although he studied physics. I did study electrical engineering, but I can still learn lots of things from him (check out his filter section!). Audio without ANY compromise! I created his initial program for the PIC16C84. He uses this PIC in his audio amplifiers to control everything (volume, LCD display, IR-remote control are all controlled by this PIC). Marco Mantel's KOI carp site. Dutch only. What do KOI carps and brewing have in common? Well temperature control for example. Marco is experimenting with a LM92 temperature sensor and I helped him a little in programming and creating a Visual Basic routine to read the temperature. Very impressive site!